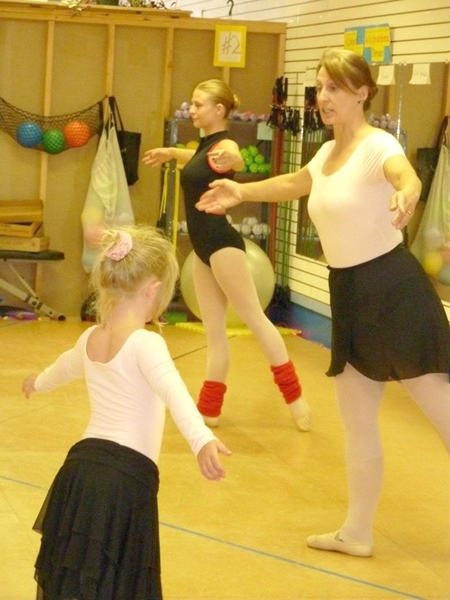 Donna Hoppens and her daughter, August, lead her younger students in dance. Donna Hoppens is one busy lady. She began assisting with dance lessons at age 15, while too young to drive herself. At 16 she began teaching dance. She currently has 21 dance classes, which include tap, ballet, jazz, and modern dance, plus eight fitness classes, which include Seniors Fitness Exercise Class and gym memberships. Consuming Fire School of Dance studio is open at 6 a.m. to 8 a.m. for fitness, 10:30 a.m. for Senior Fitness classes and dance classes for younger ones are after school. College students work their dance classes into their schedule and Donna’s. Education for Donna includes a BA from Chadron State College, ballet teaching certification from the Cecchetti Council of America, and membership with the National Dance Association. Because of her professional status with the Cecchetti Council of America, she was granted authorization to form a chapter of the National Dance Honor Society, Nu Delta Alpha, in 2004. The first two students to pass their grade one exam in ballet under Donna’s instruction, are Joslyn Young and Tara Kelso. Currently more students are working on the syllabus and must meet a minimum age requirement of 10 before being presented to the examiners. Once students have passed their exam, they are promoted to the next level. Donna is preparing for her grade five teachers’ exam that she will take before national examiners. She has a syllabus and theory book to study along with her head knowledge of each dance level. In 2000, Donna was in a bicycle versus pickup accident in Colorado. “A pickup rear ended me,” she said. A pickup hit her from behind, and as she rocketed through the pickups side view mirror, the bicycle handlebar drove into her pelvis. The driver stopped and gathered her out of the ditch where she landed, and held her to control convulsions until the rescue units came to rush her to the hospital. Donna was in the hospital for six weeks and came home in a reclined wheelchair. She had to take physical therapy to re-learn basic skills, such as rolling over in bed. Her left pelvis was shattered and has 13 pins to hold her bones together. The femoral artery was severed, she had a brain hemorrhage and blood flowed into her lungs. When attending the scheduled follow-up appointment, the doctor didn’t want to release Donna to exercise. “He said I wouldn’t be returning to dance and that I was really lucky just to walk.” There is still some nerve damage in her left leg. In the summer of 2002, Donna and her daughters, August and Victoria, moved to Chadron where she enrolled in College full time and began teaching dance once again. “I’m drawn to teaching dance. I began classes in Chadron in my basement. My first recital had 12 students and our last recital in 2008 had about 75 students,” she remarked. Each year the classes keep growing. Donna has received some contracts to work with CSC. Last summer she worked with Upward Bound Program with students from the Panhandle area. She has also worked with Roger Mays teaching choreography for plays, and with the Dakota Celts. Thinking ahead, Donna says she has a desire to make dance more accessible to more kids. “We are registered as a non-profit organization. The process took a year to complete.” she said. She can apply for grants for youth, fitness, obesity, and elderly to extend benefits to the community. She is searching for and writing grants. She would like to offer scholarships for area students to take dance. Currently the studio’s students help with fund raising for their costumes and to cover the expenses of the annual recital. The costumes are reused throughout the years. Pictures are reasonably priced because the photographer donates his time. The recital admission is free. Last year the studio sent out invitations to people who supported the students by buying their fundraising items, as a thank you. Donna humbly says, “God has blessed me with a good landlord, photographer, students and their parents.” She looks ahead to keep her students dancing and to dancing with them. For more information about the Consuming Fire School of Dance & Fitness Center in Chadron, Neb., check out the website at http://www.cfschoolofdance.org or call (308) 432-8430.